Walking past Angels in Shaftesbury Avenue Road the other week I stopped in my tracks. Didn't they only used to sell dance gear, ballet shoes etc? I am sure I remember their windows used to display tutus, satin pumps and tap shoes, but these days it's all about fancy dress. And you can see into the shop from the street. Am I going mad? I don't remember that either. I am not a fancy dress party fan. Most of them are too 'organised' for me. By which I mean I like a party with a loose theme where you can invent something subtle, but I am not into the big dos full of the kind of people who never come out all year round but will splash out for a gorilla or Elvis costume for New Year's Eve so that they can pretend to be someone interesting for a change. These are the same people who think it's disgusting to wear second hand clothes yet they will gladly hire something that has been danced about in and dribbled down by 17 other people beforehand. Ooh, got that off my chest!! I am not sure yet what I will be doing for this New Year's Eve. I've got a few options. Last year I wandered up to Parliament Hill with my sister and a friend and we stood with hundreds of other like-minded souls and waved sparklers, quaffed champagne and ate chocolates whilst watching fireworks across London. It was really lovely. Whatever you do, have a great time and here's looking forward to a happy and prosperous 2012. 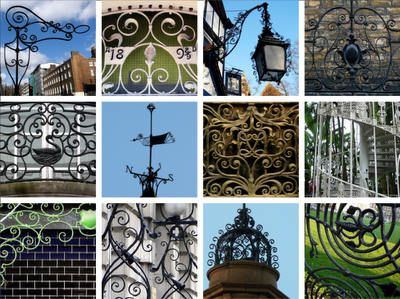 Iron work is definitely a art. This gallery is lovely. Not long ago I went to a "architectural savage" and found the most spectacular gates. I have been to many countries and seen many examples of iron work. I moved to Australia and married a lass who was into everything second hand and loved dressing up in fancy dress costumes. We built our home in the country starting with a 1868 Australian workers cottage. Extended it using mainly second hand materials including wrought iron gates. Looks a million dollars but cost only a fraction to build.